The Glacier hookah from Vapor is an ice-cold piece! Its glass vase is swirled in ice patterns and colors providing a chill before you even smoke it. The icy swirl vase is made of a durable glass to help protect from drops and hits. The small, portable size makes it a great travel buddy and is a breeze to set up and maintain. 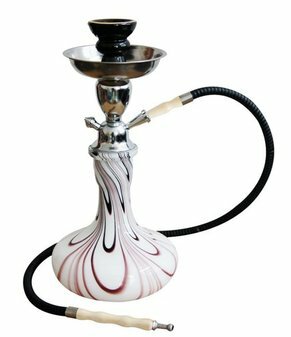 It comes fully ready to use as a full hookah set and may easily be converted to a 2-hose model by purchasing an additional hose stem adapter. 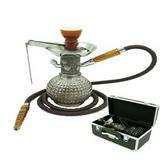 Multi Hose Capability This Vapor Hookahs brand Hookah Pipe may be converted into a 2-Hose Hookah model which utilizes the auto-seal system by purchasing additional stem adapters. Click Here to purchase a Small Chinese Hookah Hose Stem Adapter.